All New Yorkers of good will should be disgusted by Pamela Geller’s decision to plaster city buses with Islamophobic tripe effectively smearing all Muslims as being in league with ISIS, Hamas and even Hitler. I say this not as a Muslim American, but as a Sikh who has strong differences of opinion with devout Muslims about theology and lifestyle choices. But the fact is, my family owes its very survival to the tolerance of Muslims, and I feel I owe it to them to speak out on their behalf. When the Indian subcontinent was divided between India and the new Muslim nation of Pakistan in 1947, fanatics in the Hindu, Muslim and Sikh communities used religion as an excuse to attempt genocide against each other. Hundreds of thousands of people died. Millions were turned into refugees and driven to opposite sides of the border based on their religion. During this upheaval, a devout Muslim protected my paternal grandparents and their children, providing them food and shelter for several months at considerable risk to his own life. He was a colleague of my grandfather at the china factory where they both worked. Sensing that my family’s life was in danger, he hid them in a barn on his property out of view of rampaging mobs. When the violence subsided, he delivered my family to safety. It is convenient to blame all Muslims for uprooting my family from its ancestral home — just as it would be easy for Muslims to blame all Hindus and Sikhs for doing the same on the other side of the border — but nuance matters. My father was a year old, and the fact is that his life was saved by a Muslim. If his life had been cut short, my own life would not have been possible. What makes Geller’s ads so troubling is not simply that they are juvenile and intellectually dishonest but that they dehumanize Muslims. In fact, they could even incite bigots to lash out against our fellow Americans. These are not theoretical concerns. Earlier this month, Linda Sarsour — an American civil rights activist who wears a headscarf and happens to be Muslim — and one of her colleagues were accosted by a man in Brooklyn, who threatened to behead them. In December 2012, Sunando Sen — a Hindu American — lost his life after being shoved in front of a moving subway train in Queens by an assailant who declared that she hated Muslims and Hindus. The First Amendment protects Geller’s right to be obnoxious, but she should be shamed for trying to combat anti-American extremists by publicly stereotyping entire groups of people and creating a climate of fear that could endanger the lives of innocent people. 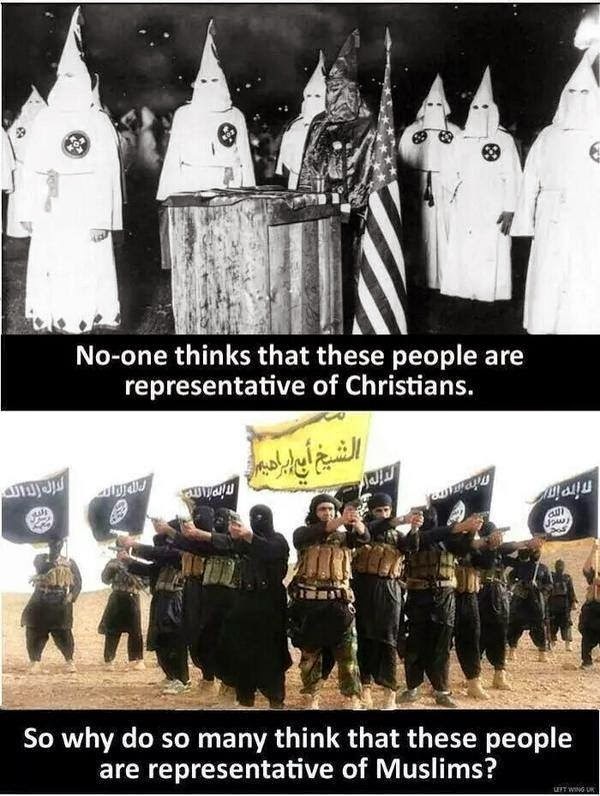 There are fringe extremist groups in many religious communities throughout the world. ISIS, Al Qaeda and others are real threats to Americans. But they constitute a tiny fraction of the total population — which, in the case of Muslims, totals up to 1 million in New York City and more than 1 billion globally. Nor is it the case that moderate Muslims are failing to condemn extremists. The devout Muslims I know are disgusted with these groups. By pandering to the lowest common denominator, Geller is failing to acknowledge the devout Muslims who are working full-time to combat extremism and promote secular, pluralistic democracies in Muslim-majority countries. A Muslim stood up for my family two generations ago and made it possible for us to thrive. Now, all of us should stand up for our Muslim brothers and sisters so that they can live in peace. Singh is director of law and policy at the Sikh Coalition, the largest Sikh American civil rights organization in the United States. Militants with the Islamic State of Iraq and Syria (ISIS) group publicly killed a rights lawyer in the Iraqi city of Mosul after their self-styled Islamic court ruled that she had abandoned Islam, the U.N. mission in Iraq said Thursday. Samira Salih al-Nuaimi was seized from her home on Sept. 17 after allegedly posting messages on Facebook that were critical of the militants' destruction of religious sites in Mosul. According to the United Nations Assistance Mission in Iraq, al-Nuaimi was tried in a so-called "Sharia court" for apostasy, after which she was tortured for five days before the militants sentenced her to "public execution." She was killed on Monday, the U.N. mission said. Her Facebook page appears to have been removed since her death. "By torturing and executing a female human rights' lawyer and activist, defending in particular the civil and human rights of her fellow citizens in Mosul, ISIL continues to attest to its infamous nature, combining hatred, nihilism and savagery, as well as its total disregard of human decency," Nickolay Mladenov, the U.N. envoy to Iraq, said in a statement, referring to the group by an acronym. The militant group captured Iraq's second largest city Mosul during its rapid advance across the country's north and west in June, as Iraqi security forces melted away. The extremists now rule a vast, self-declared caliphate straddling the Syria-Iraq border in which they have imposed a harsh version of Islamic law and beheaded and massacred their opponents. In the once-diverse city of Mosul, the group has forced religious minorities to convert to Islam, pay special taxes or die, causing tens of thousands to flee. The militants have enforced a strict dress code on women, going so far as to veil the faces of female mannequins in store fronts. In August, the group destroyed a number of historic landmarks in the town, including several mosques and shrines, claiming they promote apostasy and depart from principles of Islam. Among Muslim hard-liners, apostasy is considered to be not just conversion from Islam to another faith, but also committing actions that are so against the faith that one is considered to have abandoned Islam. The Gulf Center for Human Rights said Wednesday that al-Nuaimi had worked on detainee rights and poverty. The Bahrain-based rights organization said her death "is solely motivated by her peaceful and legitimate human rights work, in particular defending the civil and human rights of her fellow citizens in Mosul." In the nearby town of Sderat, militants on Tuesday broke into the house of a female candidate in the last provincial council elections, killed her and abducted her husband, the UN also said. On the same day, another female politician was abducted from her home in eastern Mosul and remains missing. The ISIS extremists' blitz eventually prompted the United State to launch airstrikes last month, to aid Kurdish forces and protect religious minorities in Iraq. This week, the U.S. and five allied Arab states expanded the aerial campaign into Syria, where the militant group is battling President Bashar Assad's forces as well as Western-backed rebels. In other developments Thursday, German Defense Minister Ursula von der Leyen visited northern Iraq for talks with Kurdish leaders about the fight against ISIS extremists and Berlin's efforts to help with arms deliveries. Children are a great blessing from Allah. With their tender hearts, children can be molded into righteous people only with a positive and tender approach. Islam considers children to be an amanah (trust) given to the family and says it is fard(obligatory) for the family to raise a child in a righteous manner. One should not favor one child over another. In Islam, both male and female children should be treated equally and should be loved and cherished. The children have certain rights over their parents; it is the family’s obligation to shelter, feed, clothe, educate, support, nurture, and love them. In today’s world many parents are so immersed in worldly life that they forget to pay attention to their children. Many parents think that providing financial support for their child is enough. The fact is, financial support alone doesn’t fulfill a parent’s duty towards their child. One can only win a child’s heart through love and a gentle attitude. It is the child’s right to be loved and cherished. I remember that, as a child, I yearned for the attention of my family, but being in a joint family—my family and my uncle’s family lived together and a few other cousins stayed with us as their parents were working abroad—did not give me the opportunity to experience the kind of attention I expected. My parents felt that they should not express their love for their children in front of others, as people might think they were favoring us. As a child (and even now), I heard people saying “We need not to express our love to prove that it is there, it is enough to have a loving heart.” But the fact is that only when one expresses love to a child will the child feel more confident and stronger. Children have the capacity to easily distinguish when there is a difference in the attitude of the adults. Whether an adult shows or does not show love will have a significant impact on a child. Hence, we adults have to be conscious with our behavior in the child’s presence and be constantly aware of the emotions we project to our children. Nowadays, we see people have become hardhearted so that their attitude towards children is unpleasant. There are some who show much partiality toward one gender, and there are some who don’t treat others’ children with the same kindness or affection which they show to their own children. It is common to see even people who claim that they act on the Qur’an and Sunnah showing less interest in playing with their children or giving them the due attention or expression of love. The Prophet (peace and blessings be upon him) is the model for the whole of humankind. His attitude towards children was always compassionate and merciful. Being fond of children, Prophet Muhammad showed great interest in playing with them. His involvement in children’s games shows us the great importance in playing with our children. He would have fun with the children who had come back from Abyssinia and tried to speak in Abyssinian with them. It was his practice to give lifts on his camel to children when he returned from journeys. It was a Saturday afternoon I had lunch with a friend in Gurgaon before I decided to head home. The metro for those who do not take it or belong to Delhi can get crowded and air tight to an extent that the Tupperware guys could take inspiration. I luckily managed to find a seat till Rajiv Chowk metro station (Connaught Place) where I had to change my train. The doors opened… Btw I was in a regular and not the women’s only coach – why is this little detail important for this post? Well the answer lies ahead. So where were we? Yes, the doors opened and people began to flood in. I tried to push and nudge my way out but no luck. With a huge sigh I decided to get off at the next station - New Delhi. As I positioned myself close to the exit door I felt a sense of unease run through my body, like someone has pierced their gaze on me or someone is watching me. Suddenly I felt something touch me from behind. With half my mind on trying to get off at the next station I turned thinking it was someone’s bag or hand touching me repeatedly. I turned to see a man in a white kurta (long shirt) staring right at me and he had no baggage with him. In fact both his hands were clenching the railing next to him. But if both his hands were up there what was it that… I got my answer as soon as I lowered my sight. There beneath that long shirt I could clearly see that this man was UNZIPPED. I felt the blood rush to my head, boiling and fuming and fury ran through every nerve in my body. Within that fraction of a second every single eve teasing incident, every darn face of those guys who had the guts to molest someone I know flashed in my mind. Before I knew my voice escaped my lungs and there I was screaming at the man who dared to mess with me. These were some of the things I uttered looking right into his eyes. He was startled and started blabbering that he is sorry and insisted that it was his hand that touched me by mistake. Your ‘HAND’ that comes out from your pants? How the hell was your zip open? I was screaming in a coach full of men and women. Did anyone come forward to help or even displayed basic courtesy to ask me what was wrong? The answer was a big unsurprising NO. I turned and spotted two men in fact smirking at me. Their silence tried my patience and ALL HELL BROKE LOOSE. I held that (namesake) man’s collar and dragged him out of the train. He was on a loop mode ‘It was my hand, it was a crowded train’. The moment we set foot at the platform he managed to escape. I ran, with all the strength and courage in me, I ran after him making as much noise as I could. A few saw (the tamasha), the others gasped while one man in the uniform began to chase him. I went towards the other side and we managed to get hold of him. I yelled again How dare you? How did you dare to touch me? People like you make Delhi a nightmare for girls? You make us question every time before we step a foot outside. HOW DARE YOU? People watched the guards dragging a man to the control room and a girl screaming at him. They only watched. As we took him to the control room he told the police that I am mistaken, it was his hand that touched me by mistake and it could happen to anyone because it was a crowded train. “Ask her… it was my hand”, he said. 15 guards, all men turned towards me as he tried to shame me. But if he had the guts to do it I had the spine to say it. You see anger brings out the strength you never thought you had in you but in my case anger brought out a language I never thought I could use. I was outright and I had all the right to be – “Lift up that kurta and you will know exactly what touched me”. There. I said it out loud and clear. The guards felt outraged and charged at him. Within seconds he begged for an apology and suddenly the hand in question transformed into a part of his body he wished he never had. “Why would this girl lie? After all she is taking the blame on herself”, said the police officer to the criminal infront of me. He committed the crime, I raised my voice and yet somehow the shame was on me. That statement reflected the thought process of our society, in fact it said much more. I argued with the officer and told the man in question that I have lost NOTHING in this entire episode and in fact I will make him pay for this. He immediately begged for an apology and I instead, insisted to file an FIR. After a few calls, 5 friends of mine reached the station to back me up and how? They were equally angered and showed no mercy. We moved to Kashmere Gate police station and I slapped a sexual molestation case against him. He was arrested and put behind bars immediately. I decided to not let this one go and appeared at the court on Monday to record my statement in front of the magistrate. Meanwhile this man has been moved to Tihar jail and will spend his time behind the bars until he gets bail. You see there are several measures being taken to make our public spots and transport safe. Someone asked me as to why I did not take the women’s only coach? But honestly that’s not a solution. These reservations in fact paint the idea that it is not ok or safe for women to be in public spaces. It's debatable, I know but are reservations really improving the situation? Then what would? I think the answer lies within us. Unless women put forward that is not OKAY for someone to touch and get away with it, nothing will change. I could just bite the bullet and accept that I was eve teased or molested. Or I can raise my voice and instill the fear in the criminal instead of victimising myself. If this man has the guts to unzip in a metro full of people, he probably started off by doing something less offensive to another girl. Her silence was his encouragement. Remember every time you choose to ignore or walk away, you put someone else in danger. So I urge women to respect their body and know that it’s okay for you to say that someone touched you without your consent and you have to muster the courage to reach out to the police. I insist please for the sake of womanhood – SPEAK UP! Jews at the western or wailing wall circa 1900. Much like previous Muslim Empires, the Ottomans showed great toleration and acceptance of non-Muslim communities in their empire. This is based on existing Muslim laws regarding the status of non-Muslims. They are protected, given religious freedoms, and free from persecution according to the Shariah. One of the first precedents of this was the Treaty of Umar ibn al-Khattab, in which he guaranteed the Christians of Jerusalem total religious freedom and safety. The first instance of the Ottomans having to rule a large number of Christians was after the conquest of Constantinople by Sultan Mehmed II in 1453. Constantinople had historically been the center of the Orthodox Christian world, and still had a large Christian population. As the empire grew into Europe, more and more non-Muslims came under Ottoman authority. For example, in the 1530s, over 80% of the population in Ottoman Europe was not Muslim. In order to deal with these new Ottoman subjects, Mehmed instituted a new system, later called the millet system. Under this system, each religious group was organized into a millet. Millet comes from the Arabic word for “nation”, indicating that the Ottomans considered themselves the protectors of multiple nations. Each religious group was considered its own millet, with multiple millets existing in the empire. For example, all Orthodox Christians in the Ottoman Empire were considered as constituting a millet, while all Jews constituted another millet. Each millet was allowed to elect its own religious figure to lead them. In the case of the Orthodox Church (the biggest Church in the Ottoman Empire), the Orthodox Patriarch (the Archbishop of Constantinople) was the elected leader of the millet. The leaders of the millets were allowed to enforce their own religion’s rules on their people. Islamic law (Shariah) had no jurisdiction over non-Muslims in the Ottoman Empire. In cases of crime, people would be punished according to the rules of their own religion, not Islamic rules or rules of other religions. For example, if a Christian were to steal, he would be punished according to the Christian laws regarding theft. If a Jew were to steal, he were to be punished according to Jewish laws, etc. The only time Islamic law would come into account was if the criminal was a Muslim, or when there was a case involving two people from different millets. In that case, a Muslim judge was to preside over the case and judge according to his best judgement and common law. In addition to religious law, millets were given freedom to use their own language, develop their own institutions (churches, schools, etc), and collect taxes. The Ottoman sultan only exercised control over the millets through their leaders. The millet leaders ultimately reported to the sultan, and if there was a problem with a millet, the sultan would consult that millet leader. Theoretically, the Muslim population of the Ottoman Empire also constituted a millet, with the Ottoman sultan as the millet leader. The Ottoman Empire lasted from 1300 to 1922. Throughout most of this history, the millet system provided a system of religious harmony and belonging throughout the empire. As the empire expanded, more millets were organized. Separate millets existed for Armenian, Catholic, and Orthodox Christians, for example, with each sect being divided further into more specific regional churches. The millet system did not last until the end of the Ottoman Empire. As the empire weakened in the 1700s and 1800s, European intervention in the empire expanded. When the liberal Tanzimat were passed in the 1800s, the millet system was abolished, in favor of a more European-style secularist government. The Ottomans were forced to guarantee vague “rights” to religious minorities, which in fact limited their freedoms. Instead of being allowed to rule themselves according to their own rules, all religious groups were forced to follow the same set of secular laws. This actually ended up causing more religious tension in the empire, which was one of the causes of the genocide of the Armenians during World War One in the Ottoman Empire’s dying days. The millet system was a unique and creative solution to running a multi-ethnic and multi-religious empire. The rights and freedoms it gave to religious minorities were far ahead of their time. While Europe struggled with religious persecution into the 1900s, the Ottomans created a harmonious and stable religious pluralistic system that guaranteed religious freedom for hundreds of years. "Allah! is besides whom there is no God, the Everliving, the self-subsisting by whom all subsist; slumber does not overtake Him nor sleep; whatever is in the heavens and whatever is in the earth is His; who is he that can intercede with Him but by his permission? He knows what is before them and what is behind them, and they can not comprehend anything out of His knowledge except what He pleases, His knowledge extends over the heavens and the earth, and the preservation of them both tires Him not, and He is the Most High, the Great." 1. Holy prophet (PBUH) said: whoever recites the first 4 ayats of Surah al-Baqarah (chapter: The cow), then Ayatul Kursi and then the last 3 ayats of Surah al-Baqarah, will not be inflicted with any kind of difficulty in his wealth or himself, Satan will not come near him and he will not forget the Qur’an. 2. Holy Prophet (PBUH) said: Qur’an is a great word, and Surah al-Baqarah is the leader of the Qur’an and Ayatul Kursi is the leader of Surah al-Baqarah. In Ayatul Kursi there are 50 words and for each word there are 50 blessings and good in it. 3. 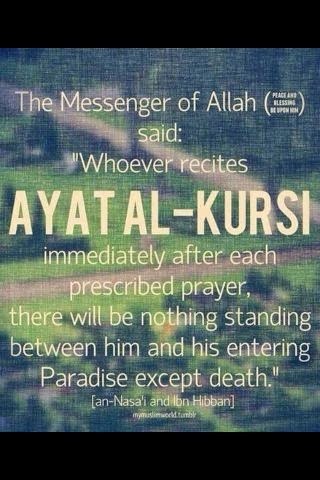 One who recites Ayatul Kursi every morning will be in the protection, safety of Allah until the night. 4. If one ties this to ones wealth or children, they will be safe from Satan. 5. Our Holy Prophet (PBUH) has said: These things increase ones memory: sweets, meat of an animal which is slaughtered in Islamic manner near the neck, Lentils, cold bread and recitation of Ayatul Kursi. 6. For those of our dear ones who have passed away, recitation of Ayatul Kursi and giving it as Hadiyeh to them, gives them light (noor) in the grave. 7. Frequent recitation makes ones own death easy. 8. When leaving home, if one recites it once, the Almighty has one group of Angels to come and protect you. If recited twice, 2 groups of Angels are assigned to do this. If recited 3 times Allah tells the Angels not to worry as the Almighty himself takes care of him. 9. The Holy Prophet has said: If one recites Ayatul Kursi before going to sleep, Allah will send an Angel to come and look after you and protect. 10. When one is alone in the house, recitation of Ayatul Kursi and asking Allah for help will make you remain calm and you will not fear. 11. The Holy Prophet has said: When leaving home, if one recites Ayatul Kursi, then Allah will send 70,000 Angels to do Istighfaar for him until he returns home, and upon his return Poverty will be removed from him. 12. One who recites it after every prayer, their salat will be accepted, and they will remain in the safety of the Almighty and He will protect them. 13. Allah told Prophet Musa (a.s): If one recites it after every salat, the Almighty will make his heart a thankful one (Shakireen) will give him a reward of the prophets, and his deeds will be like those of the truthful (Siddiqeen).